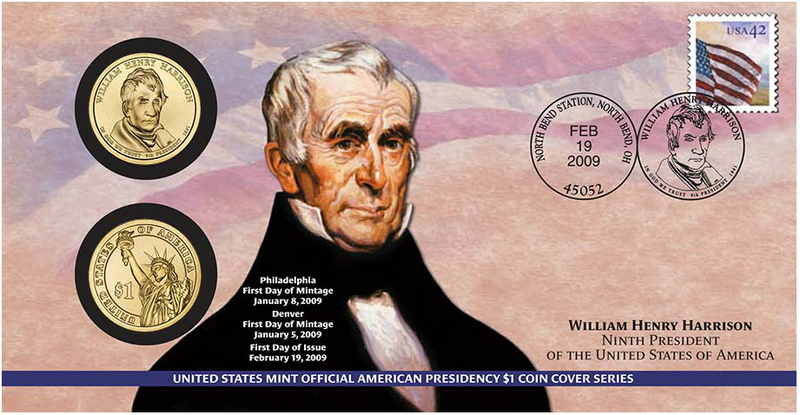 The William Henry Harrison Dollar was the first release of the Presidential Dollar series for the year 2009. It marked the ninth release in the series overall. Notably, this was the first Presidential Dollar which carried the “In God We Trust” motto on the obverse of the coin rather than the edge lettering. The official release date was February 19, 2009. William Henry Harrison became the ninth President of the United States in 1841. He delivered his one hour and 45 minute long inaugural speech during a rainstorm, without wearing a hat or coat. As a result of the exposure to the elements, he developed pneumonia and died just 30 days after his inauguration. He was the first President to die in office. 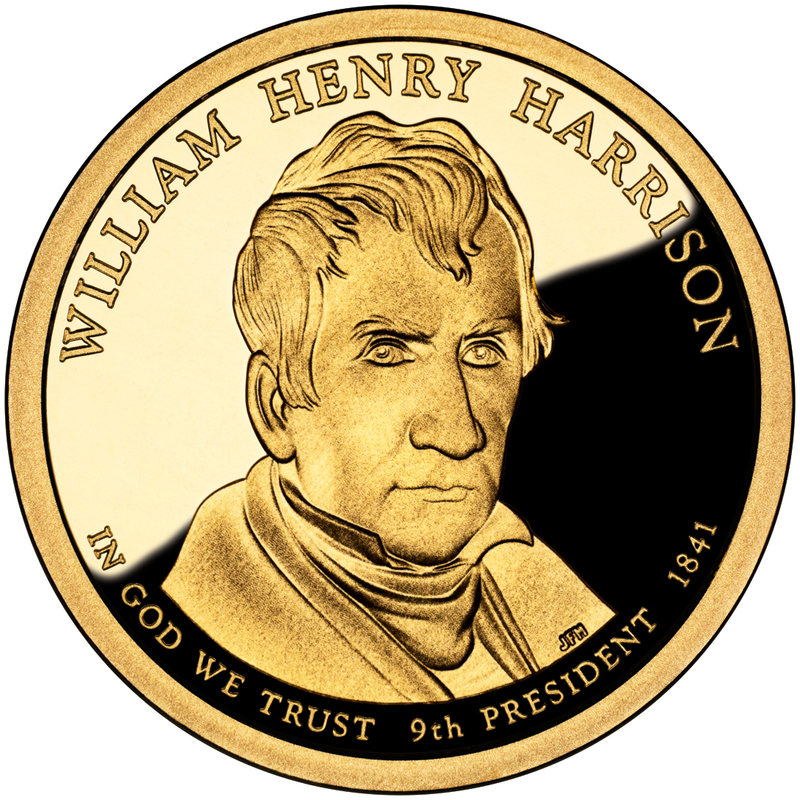 An official launch ceremony for the William Henry Harrison Dollar was held on Berkeley Plantation in Charles City, Virginia. The event included a ceremonial coin pour, tours of the 18th century manor, a coin exchange, and a free William Henry Harrison Presidential Dollar for children in attendance. The ceremony was attended by US Mint Deputy Director Andrew Brunhart. 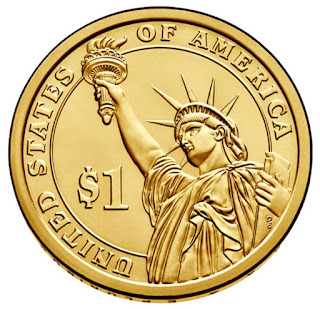 The reverse of the coin will continue to bear the same Statue of Liberty design used on all prior coins of the series. The reverse was designed and sculpted by Don Everhart. 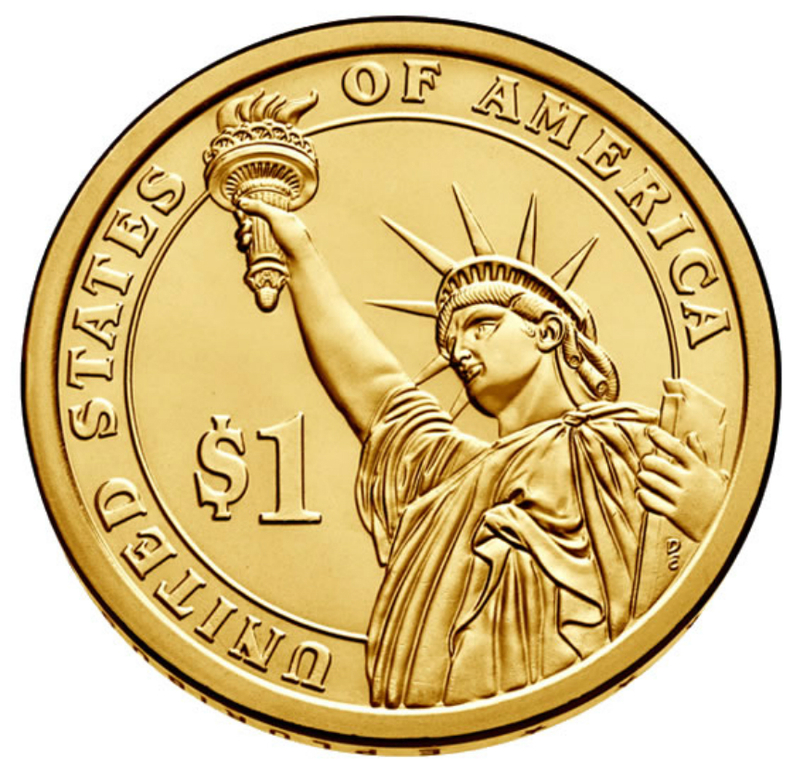 The date, mint mark, and motto “E Pluribus Unum” appear on the edge of the coin. Thirteen stars are used to separate the motto and date. The mintage for the 2009 William Henry Harrison Presidential Dollar marked another low for the series. The Philadelphia Mint produced 43,260,000 coins and the Denver Mint produced 55,160,000 coins. This was the first release of the series with an overall circulation mintage below the 100 million level. One of the oddities of this release is the high premiums paid on some secondary market venues for US Mint packaged 25-coin numismatic rolls. The US Mint had offered previous Presidential Dollar rolls for extended periods of time, and consequently sold large numbers of them. For the William Henry Harrison Dollar Rolls, the US Mint unexpectedly sold out after customers ordered 30,000 rolls from each Mint facility. Secondary market prices quickly rose to $200 or more for each 25-coin roll, a price level that continues to be maintained. Although some subsequent Presidential Dollar numismatic rolls would have similarly low production runs, none have excessive premiums like the Harrison rolls. William Henry Harrison (February 9, 1773 – April 4, 1841) was the ninth President of the United States (1841), an American military officer and politician, and the last President born as a British subject. He was also the first president to die in office. He was 68 years, 23 days old when inaugurated, the oldest president to take office until Ronald Reagan in 1981. Harrison died on his 32nd day in office of complications from pneumonia, serving the shortest tenure in United States presidential history. His death sparked a brief constitutional crisis, but its resolution left unsettled many questions following the presidential line of succession in regard to Constitution up until the passage of the 25th Amendment in 1967. He was the grandfather of Benjamin Harrison, who was the 23rd President from 1889 to 1893. Before election as president, Harrison served as the first territorial congressional delegate from the Northwest Territory, governor of the Indiana Territory, and later as a U.S. representative and senator from Ohio. He originally gained national fame for leading U.S. forces against American Indians at the Battle of Tippecanoe in 1811, where he earned the nickname "Tippecanoe" (or "Old Tippecanoe"). As a general in the subsequent War of 1812, his most notable action was in the Battle of the Thames in 1813, which brought an end to hostilities in Upper Canada. This battle resulted in the death of Tecumseh and the dissolution of the Indian coalition which he led. After the war, Harrison moved to Ohio, where he was elected to the United States House of Representatives. In 1824, the state legislature elected him to the U.S. Senate. He served a truncated term after being appointed as Minister Plenipotentiary to Colombia in May 1828. In Colombia, he spoke with Simón Bolívar, urging his nation to adopt American-style democracy. Returning to his farm in Ohio, Harrison lived in relative retirement until he was nominated for the presidency in 1836. Defeated, he retired again to his farm. He was elected president in 1840, and died of pneumonia in April 1841, a month after taking office.